If you’re like me, and you don’t see 33-degree Celsius weather as a reason not to indulge in a hot bowl of soup, this recipe is for you. It’s simple, and it doesn’t have too many seasonings. It doesn’t need to — summer’s fresh bounty adds flavor enough. Remove the stems from the okra and dice into short segments. Fry in a thick frying pan with some olive oil, stirring occasionally — you don’t need to deep-fry the okra, but you will want to cook it until soft. In the meanwhile, you can cook the rest of the soup. Dice the onion and fry in some olive oil in a thick-bottomed pot. When it begins to become transparent, add the garlic, also diced (or crushed). Add the tomatoes, chopped. Add enough water to cover the tomatoes, the lemon juice, the turmeric and the salt. Add the chopped parsley leaves as well. If you want, you can tie the stems into a bunch and put them in the pot to simmer for extra flavor, and remove them at the end. Cover the pot and let simmer until the tomatoes soften. By now, the okra should be fully cooked. Add into the tomato soup base, and let simmer some more, so that the okra absorbs the flavor. Garnish with a few parsley leaves to serve. 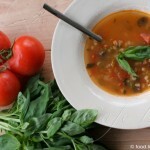 7 Responses to "Tangy tomato okra soup"
Your pictures are inspiring! They make me want to try to make the recipes. Hi. 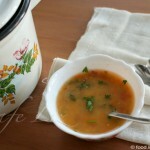 Just saw your recipe for tomato okra soup and wondered if it omitted some stock or water? It doesn’t seem like this would make much soup as is, with just 3 tomatoes as the only liquid. Hi Robin, I didn’t put water in the ingredient list (maybe I should have), but I do indeed add water — enough to cover all the other ingredients. It appears in the cooking instructions instead. As a rule, I don’t like to use broth, but you could if you like. I will start to grow tomatoes in my farm and now learning watever i can about them, thanks for information. I just made this recipe. Thanks for suggesting frying the okra first. I had no lemon, but I added lemon grass and some crushed red pepper for additional flavor. Note to others: add as much water as you like, if you prefer a less thick soup. Hi Victoria, your version sounds great! Thanks for telling me about it. This recipe sounds great! Too bad this is December instead of July, so I would have fresh okra and tomatoes on hand… Why is it that soup weather and garden weather are always 6 months apart? I use a new variety of okra called Heavy Hitter. 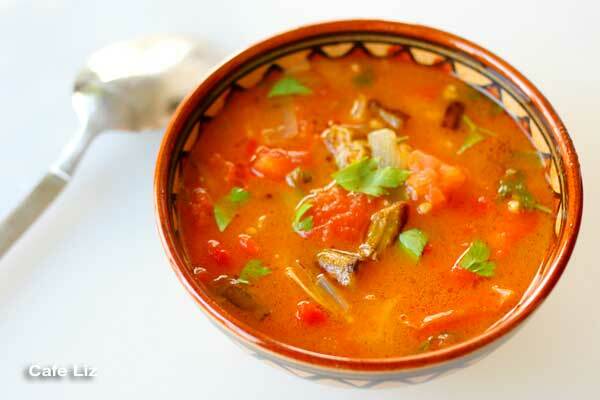 It has a great flavor and texture for soups and gumbo. It’s so crisp we eat it raw right there in the garden. There’s nothing like fresh, crisp, okra to settle your stomach early in the morning on a gorgeous Summer day. 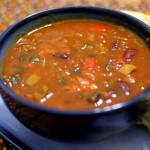 I wish I had some right now, or else I’ll be thinking of tangy okra and tomato soup all day.